Mayor Guyton will kick off the event on Tuesday May 23rd at Noon. We encourage community groups to join forces and attend the kickoff event to pick up garbage bags and other materials that will be furnished to assist in the cleanup effort. 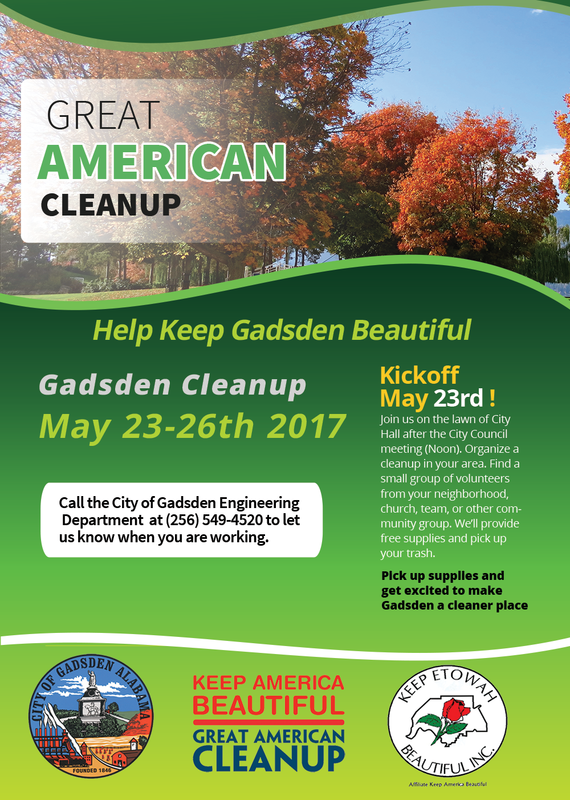 If you would like to participate, but can’t attend the kickoff event, please call the City of Gadsden Engineering Department at (256) 549-4520 and we will be happy to assist you. Also, once your cleanup efforts are complete, please give us a call at the same number and we will arrange for trash pickup at the end of the event on May 26th.